Captain Stephen O’Donnell says the lessons Coleraine learned from their Europa League adventures last year will stand them in good stead this season. The Bannsiders were on the end of a 7-0 first leg defeat Haugesund before they held the Norwegians to a goalless draw at The Showgrounds in the return game. O’Donnell believes that experience will be beneficial when they take on Spartak Subotica in Serbia this Thursday. “Having played last year as a group, we didn’t get the result we wanted but we learned a lot last year and I think that stood us in a good stead for the season,” he said. “The lessons we learned about game management and how to play against quality opposition, this season is about showing ‘this is what we have learned from last season’, ‘this is how well we have improved as a team and as a group’ and for this European tie it’s about being competitive. “If you want to be successful then these are the games you want to be involved in and yes it’s a different style of football completely. 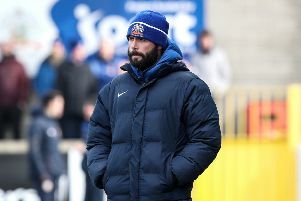 “It’s a lot more technical than maybe the Irish League and it’s a lot more demanding in terms of your mental concentration, but it’s something we are looking forward too and Thursday night’s first leg tie is about showing what we have learned from last season. “We feel as a group and the quality we have in the changing room then we can genuinely can go and be competitive. “Pre-season has been good and yes it has been tough, as expected, but to be fair to the boys they have all looked after themselves well and they have come back in good shape. We have done plenty of hard work and plenty of running, but it’s about getting games.